So I finally have had a chance to participate in the monthly PTI blog hop… I’ve been missing them, and so I was so glad when I got to sit down and play a little last night! It’s not my most favorite card, but I don’t mind. I keep forgetting that I don’t have to reinvent the wheel for every project… Sometimes, it’s nice to sit and just play. I love the size of the Fab Flakes set. The snowflakes are large enough to really make a statement. Bearing that in mind, I decided to make a 5×7 card instead of a normal A2 sized card. I stamped the flakes in Simply Chartreuse, Hawaiian Shores, Tropical Teal, and Delicata Silver. I love how they look all clustered together. The sentiment is from Christmas Cheer, die cut from Tropical Teal and stamped in Smokey Shadow. I covered the die cut in some Shimmer Pico Embellishment, added a few sequins for sparkle, and mounted it on a clean white card base. I thought about sponging some ink around the edges, but I decided I liked the way it looked as is. Fabulous card! Love your design and all of those gorgeous snowflakes. OMG, I might have to order those snowflakes now! This is gorgeous. So pretty! Love those snowflakes! Gorgeous card… The colors and design are just stunning! Well, I think this is just stunning!! Wonderful. love the non traditional colors throughout. Pretty card! I love the colors and layering of images. Amazing! 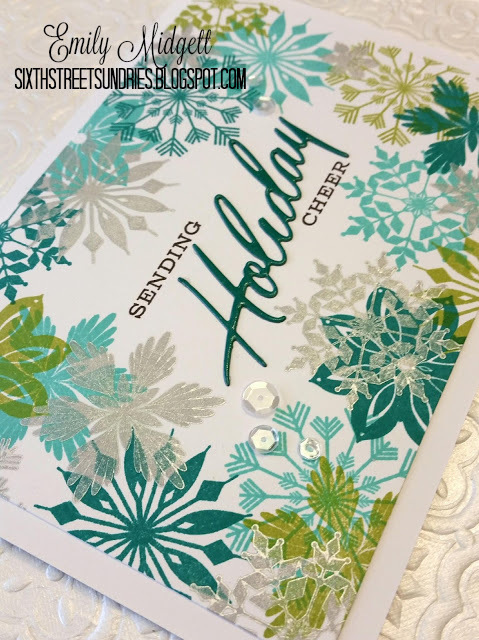 Your color combination with the stamped snowflakes is gorgeous and the sentiment is beautiful! This is a stunner for sure! I'm sorry your lil one is sick~I pray for fast healing and a Happy Thanksgiving! What a lovely snow flurry! VERY pretty snowflake card! Love the silver flakes on top, too.